While simulating a relationship with Chakotay on the holodeck, Seven begins to learn that making mistakes is a part of life's imperfection. Is it so wrong to be human after all? - Out of the Star Trek episodes he has written, André Bormanis named this as one of his favorites. He explained, "It was a metaphor for dealing with post-traumatic stress disorder, and we got some truly moving responses from the fans." - During the second to last attack on the USS Voyager by the subspace warheads in the firing range, Seven can be heard telling Lieutenant Tom Paris to "isolate subspace band Omicron Theta." Omicron Theta is the former home of scientist and cyberneticist Dr. Noonian Soong and the birthplace of Data. - This episode shares a commonality with the TNG episode "Hollow Pursuits"; that is, a crew member neglecting their duties in favor of a holographic fantasy involving holographic recreations of crew members, with Seven in the place of Barclay. 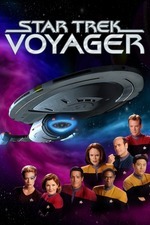 - This episode takes place three months before the events of VOY: "Endgame" according to a statement made by Seven in that episode. "At least we know who to call if there's a containment breach!" "Slice these vegetables transversally in five-millimeter increments." "Give me a hand with this?" "I'm surprised your Starfleet training didn't include cork extraction." "I must've been sick that day." "Looks like wine's off the menu." "Unless you brought a phaser." "Never on the first date." This one, on the whole, just feels pretty inept to me. As always, the acting keeps it watchable—Ryan and Beltran get some good actor-ly moments here—even when the dialogue (and, really, the premise) made me cringe. Mrs. CoB remarked that it was like watching one's parents as teenagers flirting, but I'd almost say it was more like watching a parent flirt with one of your spouse's parents AUGHHhhh anyway, where was I. This episode appears to establish that if you're running a holodeck program, a red alert won't interrupt you. Huh! Also interesting that a hologram, and a medical hologram at that, can't immediately differentiate Chakotaygram from the real thing. But even harder for me to look past is the Chakotaygram's astonishing degree of psychological insight. We can't chalk it up to "well Seven must just be a really good holo-programmer" because the whole point is that she LACKS the sort of deep human understanding that she'd need to WRITE a character like that. Maybe we're supposed to infer that the Chakotaygram has been running a lot, and developed this insight in the same way that Moriarty and our EMH did, but I thought they rationed their holodeck time? ¯\_(ツ)_/¯ Obviously they wanted Seven to Learn Lessons and didn't think too long about where they were coming from. I was surprised by Bormanis's remark that this specific story is a metaphor for PTSD. I completely missed that. And I'm no stranger to literary PTSD metaphors, and of course Seven as a character is one big walking PTSD metaphor. I mean, I guess I can see it now—the way she misses work and everything—but as MA notes, in TNG: "Hollow Pursuits" Barclay missed work in the same way for reasons having nothing to do with PTSD, and since that episode is sort of the Ur-Holodeck-Irresponsibility Episode, I can't think I'm the only viewer whose mind went more in that direction, despite this script taking care not to suggest that holoaddiction was at play here. Likewise, the metronome as a symbol: it works when viewed through the PTSD lens, but the story pushes us toward interpreting it as Seven's attachment to perfection. Yes, it can be two things, but I dunno, maybe the story needed to go to more overtly dark places for the PTSD stuff to emerge more clearly. Wikipedia says that "[i]n 2015, Brannon Braga stated on Twitter that he felt that it should have been Seven of Nine who died in the finale, and that he had written the episode 'Human Error' specifically to set this up." Not to step on the toes of Jack's upcoming "Endgame" post, but apparently, the whole Chakotay-Seven business originated partly from Braga as well. I also want to include, for reasons I'll explain after, a lengthy quote from Bernd Schneider of Ex Astris Scientia: "Keeping apart Borg perfection and human imperfection, as well as duty and private life, is a problem to her. But considering that Seven didn't have a private life so far, as the Doctor noted, she still does it rather well. So it is a poor idea that eventually a Borg safety measure keeps her from becoming more human, rather than a change of mind. It makes the episode rather pointless." The punchline here is that, before I read Bernd's commentary on this episode, I SAID THE EXACT SAME THING to Mrs. CoB as the credits came up on this episode: "Well, that was pointless." Oh, and speaking of pointless, there was also a space hazard of some kind and they did sci-fi stuff on the bridge about it. Mrs. CoB remarked that it was like watching one's parents as teenagers flirting, but I'd almost say it was more like watching a parent flirt with one of your spouse's parents AUGHHhhh anyway, where was I. This may be my favorite line from all the rewatch episode discussions. Also, even though Ryan and Beltran try their darndest to make it work, all I can say is, stop trying to make C7 happen, it's not going to happen. Particle of the Week: Our buzzword of the story was 'subspace' instead of a particle. Pointless STO Comparison of the Week: Liberated Borg are fairly common by the timeframe of Star Trek Online. You can get them as various kinds of crew, lifetime subscribers can even play them and they have their own political faction (the Borg Cooperative). As a result, it may be inferred that both physical and psychological *care* for ex-Borg drones has improved considerably by the MMO's timeframe. * Maximum Possible Photon Torpedoes: -25. Voyager fired three that I saw. * Credulity Straining Alpha Quadrant Contacts: 15. * Well, that was awkward. You guys have covered the dire, no-good flirting well enough for me. (Props for the line, Cheeses - I agree with Jack that that was awesome.) That actually didn't bother me as much as it bothered either of you because I guess I'm inured to Trek romance being filled with that sort of drek, but it is particularly bad on the heels of Janeway/Jaffen from last time. So it is a poor idea that eventually a Borg safety measure keeps her from becoming more human, rather than a change of mind. It makes the episode rather pointless. So, I've been describing S7 as 'best possible Voyager,' and I still think it is: despite our complaints, the writing here is generally better than previous seasons, there's continuity and whatnot. Like, I assumed the Omicron Theta reference was a deliberate Easter Egg, which is the sort of benefit of the doubt I never would've extended this team before. At the same time, all their social commentary has either been completely misguided or weirdly bloodless. Human Error falls into the 'bloodless' category: I missed the PTSD metaphor completely too, for the reasons outlined in the post. This simply wasn't dark enough, and letting it resolve over technobabble instead of human choices removed any weight it might have had. I can't decide if 'bloodless' is worse than the 'lazy' we used to have. * It seems like this should've been an issue from the jump. I found that pretty distracting while watching this. At any rate... yeah, a pretty frustrating view that - like Jack pointed out - could have been great. I'll just say I was a little annoyed that when Seven asks B'Elanna about her hairdo, she shrugs and says "sonic shower and engine grease." Come the fork on. My hair is about the same length and not a page boy but to get it to look half as sleek as BT's I have to color it, use conditioner after shampooing, mousse it, dry upside down with a hairdryer and then use a round brush. Maybe sonic showers do magic things with hair? Other than that, the episode made me think of the deeper human connections I wish I had and wonder what I could do about that.